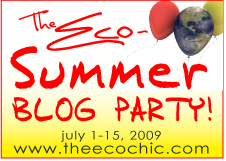 One of my goals with the Eco-Summer Blog Party was to provide you with valuable information on some hot environmental topics each day. One of the hot topics in the news lately is BPA and toxins in our plastics. All of the information out there seems very intimidating, even to me. I have read some great blogs by people who are passionate about their fight against plastics. As a crazy busy mom of two some topics are just too deep for me to grasp my arms around and embrace change. BPA and plastics is one of those topics. It’s much like global warming…I know that it is a real phenomenom and that I should change my lifestyle…but the changes that are required are just too much. We hear global warming but we don’t really know what we can do ourselves. 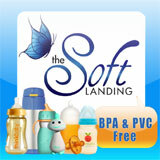 I asked Alicia Voorhies, owner of the online retailer The Soft Landing, to educate us a little about BPA and plastics. Guest Post by The Soft Landing’s owner, Alicia Voorhies. Coupon Code at bottom of post! Surely you’ve heard about Bisphenol-A (BPA) by now. It’s an endocrine-disrupting chemical found nearly everywhere with over 6 billion pounds of it produced each year. It’s most well-known use is as a building block for polycarbonate, a hard plastic commonly used in clear plastic baby bottles. Studies show that BPA can leach from its unstable bond into food and drinks. Leaching occurs at room temperature, but especially when containers are heated – to the tune of up to 55 times more. In more recent studies, 93% of Americans were found to have higher levels of BPA in their bodies than previously thought. BPA is essentially a synthetic estrogen that disrupts the reproductive systems of both males and females. It was actually considered as a possible form of estrogen for estrogen replacement pills in the 1930s. The sperm count of the average male has begun a steady decline over the last 50 years as many males are becoming more feminine. But that’s not all. Scientists have linked BPA to a growing list of ailments: cancer, reproductive and cardiovascular system disorders (including damage to the prostate gland, infertility and early puberty), brain and neurological system dysfunctions, behavioral problems, diabetes and obesity. It’s become apparent that the FDA isn’t going to ban the use of BPA in our food containers anytime soon. Nor will they require manufacturers to label their products when they contain do BPA. So how can a concerned parent navigate the confusing sea of unlabeled products? You shouldn’t have to be a rocket scientist to find safer eating gear for your family, so let’s look at some simple strategies for avoiding BPA. Staying away from plastics in the recycling category #7 is the most common strategy for avoiding BPA. It’s a fine way to start making general changes, but not all #7 plastics contain BPA. Over the last year, several new plastics, such as PES and copolyester, have been introduced as BPA-free alternatives. This serves to confuse the issue because they look just like polycarbonate and are placed in the same “other” recycling category (see Are all #7 Plastics Toxic? for a more detailed discussion on this complicated topic). Even more confusing is that some polypropylene products (in the #5 recycling category) can contain BPA after all. When a polypropylene product is tinted with color, the colorant base used may be made from BPA, adding a small amount of the chemical to an otherwise BPA-free plastic. So recycling codes should only be used as a very general guideline. Purchase products from a reputable company who completes the research for you (such as www.thesoftlanding.com). More proactive companies are taking steps to create non-plastic options in an effort to meet the demand for BPA-free products. Several materials are naturally BPA-free because they simply don’t need the chemical during production: glass, stainless steel, silicone, natural rubber, bamboo, wood and corn-based bio-plastics are some of the major players. And they’re not only safer, but they’re easier on the environment too. We’ve compiled an extensive list of great alternatives in food storage containers to make your life a little easier (see BPA, PVC and Phthalate Free Food Storage Containers). In the meantime, let’s continue letting manufacturers and the chemical industry know that we won’t be buying their toxic plastic. Take a minute to sign the Environmental Working Group’s petition to protect children today! Alicia was kind enough to provide a coupon code for 15% off any purchases made at The Soft Landing from July 9th-15th. One quick and easy change we can make is to stop buying water in plastic bottles. The longer water sits in a bottle, the more of the toxins dissolve from from the container into its contents. It is unhealthy for both us and the planet to keep the bottled water industry in business. It is an easy habit to develop to grab your own water bottle on the way out the door. Even if you are still using an old plastic water bottle, the water will be far purer if you fill it and drink it in the same day. WE ONLY CARRY BPA-FREE PLASTICS. IT IS COMPLETELY RIDICULOUS THAT THE SCIENTIFIC FACTS ALL POINT TO THE FACT THAT IT IS BAD FOR YOUR HEALTH, BUT IT IS STILL ALLOW IN PRODUCTS. Thanks guys for you additional info! XOXO!